Remembering 9/11 Originally uploaded by ekota. 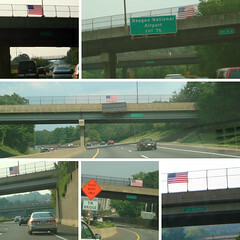 As I was heading into the city today, I started noticing the flags on the overpasses on 66. It reminded me of the sense of patriotism that we saw 5 years ago, where flags seems to appear on bridges and overpasses through out the area. Even 5 years later, it's still hard to think about what happened. Hearing the stories of what the survivors are going through is saddening. My thoughts and prayers and with them and their families. I recently uploaded some pictures of Dakota to Flickr for safe keeping. 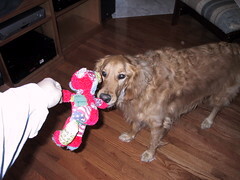 Looking at the pictures has brought back lots of memories including that of one of his favorite toys. Mr. bear. Chris said the bear wouldn't last. The material it was made of was pretty weak. I was convinced it would and with it's first wound decided it was too soon for Mr. Bear to leave and patched him up. One patch turned into many more patches. Dakota used to sit patiently and wait for his toys to be sewn up. Mr. Bear was the toy hospital's most frequent patient. But probably one of the best loved too. 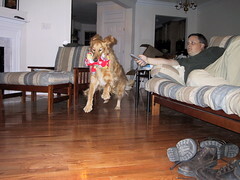 After we lost Dakota and got another dog, most of the toys were given to the new puppy. But not the Bear. Dakota's bear lives in the closet in the mud room. He may just stay there forever. He's well loved with all his patches and threads hanging. He will never be given to another dog. I don't think I could ever throw him out. Everytime I see him, he brings a smile to my face and a sadness to my eyes for a dog whose time with us was way too short. Dakota taught us a lot in that short time. He was dog who loved life despite the challenges and obstacles thrown his way. He never met anyone he didn't like... well, except the dentist.